At a sunny “YOUR Radio 103FM Stadium” both teams entered this Betfred Cup Group E match looking to gather their first points of the campaign and it was the visiting Black and Golds with a 4-3 penalty shoot-out victory which sees Annan move into 4th position. Manager Peter Murphy made two changes to the starting line-up with Hooper and Krissian coming in for Brannan and Watson respectively, latest signing Ellis Pearson was a substitute. There were few chances created in the first half with Dumbarton having more of the possession, the main talking point however was the sending off of ex Galabank trialist Christian Nade who was sent to the dressing room for foul and abusive language following what he believed to be a claim for a hand ball and penalty being turned down. Dumbarton thought they had taken the lead in the 52nd minute when Stewart tapped in from close range following a save from Annan’s keeper Atkinson. The assistant referee had his flag up for offside to the disdain of the celebrating home fans. Minutes later Daniel Orsi beat Gallagher in the Dumbarton goal only to see his shot rebound of the inside of the post. Orsi then had another shot saved by Gallagher before Annan were awarded a free kick six yards from goal following a pass back. Referee Charleston waved away the shouts for handball from the resulting free kick. The woodwork once again denied Annan taking the lead as Stevenson hit the post. 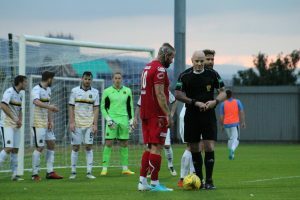 Moxon was red carded following a second yellow card, shortly after Annan were awarded another indirect free kick in the box, this time Gallagher saved well to deny Ryan Sinnamon opening the scoring. Stevenson’s had another attempt but was wide of target as Annan had their best spell of the match. The new format sees drawn games go straight to penalties with the shoot-out victors gaining an extra point. The successful penalty takers for Annan were Smith, Sinnamon, Omar and Stevenson. Annan now face manager Peter Murphy’s previous club, group leaders and undefeated Ayr United on Saturday afternoon in the last round of fixtures, the visitors will be looking to secure at least the single point that will see them top Group E. Annan will be looking to make further progress in their preparations for next week’s Ladbrokes League 2 opener against favourites Peterhead FC.